One of the most overlooked pieces of tactical equipment for civilians, without question, is body armor. Many people are under the impression that body armor is for the military and law enforcement only. This could not be further from the truth. Not only is body armor fully legal in all fifty states, it’s widely available, too. 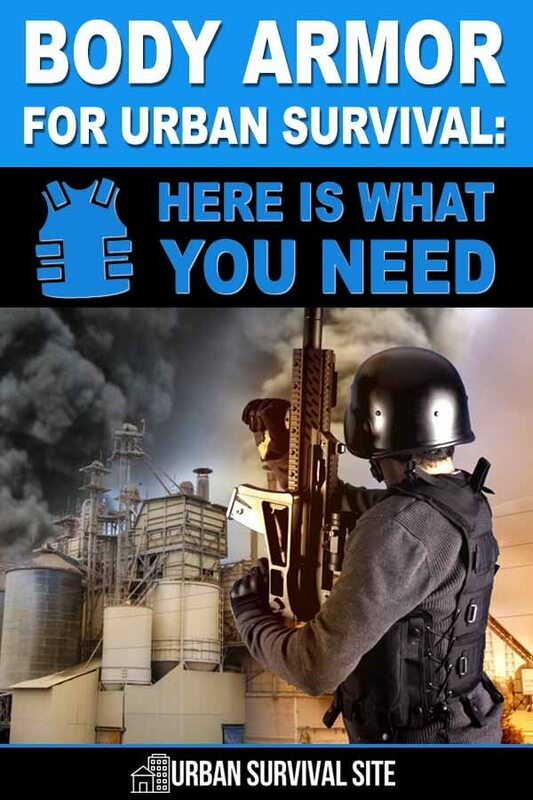 When preparing for SHTF and disaster scenarios, body armor is definitely something you’ll want to have in your arsenal. Let’s talk about body armor and what it is in greater depth. However, body armor is not necessarily bulletproof. In fact, body armor can be used to refer to any kind of covering to protect the body. Even a helmet could classify as ‘body armor’ if you want it to. Today, however, ‘body armor’ is sometimes used to refer to vests or other protective coverings made out of UHMWPE, or Ultra High Molecular Weight Polyethylene. These are essentially plastics that have been tightly woven to give them added strength. The fibers can also disperse a bullet’s energy as it travels through the various layers, so even if it can’t stop the bullet completely, it can at the very least slow it down by a significant margin. Another type of body armor that is quite common uses steel or titanium plates that are carried around the torso in plate carriers. This type of body armor is much heavier, but it also offers significantly greater protection for UHMWPE body armor. Regardless of which type of body armor you get, it is important for you to cover the main areas of your torso: your back, your front, and your sides. The armor will need to be properly positioned and correctly adjusted. Otherwise, it won’t offer you sufficient protection, especially for your ribs and vital organs. Do You Really Need Body Armor? The short answer to this question is that it’s up to you. But in all seriousness, body armor can quite literally be a lifesaver in a defensive scenario. Just imagine that disaster has struck, the power grid has collapsed, and now you have to defend your home, property, family, and supplies against raiders and marauders. Sure, you may be armed, but those raiders and marauders will be armed, too. Wouldn’t it be preferable to have at least some degree of protection to hopefully stop a bullet or shrapnel? Is Body Armor For Sure Going To Save Your Life? It’s possible that body armor will save your life, but it’s not guaranteed by any means. For example, most bulletproof types of body armor that are sold on the market will do a fine job of stopping a 9mm bullet or a similar pistol caliber. But they can’t resist a much higher caliber such as a 5.56x45mm NATO or .308 Winchester round… at least if it doesn’t have a high enough NIJ rating, which we’ll get to in a second. So while body armor cannot for sure save your life, it can at the very least increase your chances of survival, and that’s what matters. When you go shopping for body armor, the most important factor to consider is the body armor’s NIJ rating. NIJ stands for National Institute of Justice Their rating system is today widely used around the entire world as the ballistic standard of resistance. Any body armor that you can buy from a reputable manufacturer is going to have an NIJ rating. In fact, if it doesn’t have an NIJ rating, that’s good enough reason not to buy that type of body armor. The vast majority of so-called bulletproof body armor on the market will have a rating of Level IIA or lower, so if you want body armor that can stop a rifle bullet, you’ll want Level III or higher. There are many different types of body armor on the market, which we will go over now:. Soft body armor is designed to stop a round from penetrating through the armor by rapidly decelerating it, and hopefully resulting in it falling out (sort of like water coming out of a sponge). Soft body armor can work, but it really depends on what condition the vest is in and what types of bullets are being fired. Many types of soft side body armor are rated for pistol calibers of 9mm Luger or less only (so NIJ Level IIA or less), and they can usually only take a small number of rounds before failing as the armor will weaken after each shot. Soft armor usually works for preventing handgun rounds, but it is far less effective for rifle caliber rounds, if even effective at all. This is why you’ll want hard steel plates for resisting rifle rounds. Plates can be constructed from a wide variety of materials, but ceramic is the most common, which has been around for several years. Ceramic works to fracture the impact of the bullet while simultaneously slowing it down. Meanwhile, the Kevlar (which serves as the backing material) will keep the round inside of the plate. The only downside to ceramic is that it rarely works for taking multiple rounds, as the plate weakens significantly with each firing round that comes into contact with it. It’s also heavy and you’ll need an additional carrier of some kind to wear it. Another type of plate that has become very popular in recent years is the polyethylene plate, also known as poly plates for short. This is a high-quality plastic that has the ability to stop rifle rounds because it will stop the incoming round and break it apart upon impact. What’s more, it is far lighter than ceramic, which can add as much as fifteen pounds to your already heavy gear load. Steel isn’t used as often today, at least not by professional operators, because it is very heavy. Still, a strong enough steel is quite cheap and will reliably prevent rifle rounds, which can make them an effective choice for those on a budget. When you choose to have body armor, you will also need to have a carrier, regardless of whether you go with soft armor or hard armor. The best armor carriers are built out of either polyester or cotton and have Velcro straps as well. Plate carriers can only carry hard carriers like steel or ceramic, while full carriers can carry either hard or soft armor, which obviously makes them more versatile. You can also buy carriers that are fully adjustable and that allow you to attach other gear with MOLLE webbing, such as extra pouches and whatnot. Multiple stitching: Especially on the attachment points and the seams. This greatly aids in the durability and longevity of your carrier. Drag handles: So a comrade can help carry you off the battlefield if you are wounded. Adjustability: So you can adjust your carrier to your body size and shape; both the shoulder straps and the band around your torso and waist should be fully adjustable. No Elastic: Elastic is a bad choice for carriers because it weakens and your vest will, after extended use, begin to sag, which exposes vulnerable regions of your body. You must ensure that your plate is always centered over your torso, and both the front plate and the back plate need to mirror one another. You can greatly increase your chances of survival in a combat situation by investing in an armor that has a high enough NIJ rating. Just remember that you should never get too overconfident with the body armor that you wear. It doesn’t make you invincible, and it can still fail. Thanks for reading! Don’t forget to pin this post on Pinterest! I would like to see a “history” of manufacturers that have had production problems or failures. Also the best recommendations for quality, price, performance. Sometime it is better what NOT to buy as it is what to buy. First time buyer, needs a lot of information. This is a major purchase and a wrong purchase could lead to death. just a bit of FYI the round that penetrates soft body armor the best is .30 carbine ball. It seems that the shape of the .30 carbine ball ammo spreads the weave of the fabric and the round has a high enough speed to go through.